Bob Ehrlich (born as Robert Leroy Ehrlich, Jr. in Arbutus, Maryland) is a famous Politician from USA, he is 61 years old and still alive, born November 25, 1957. 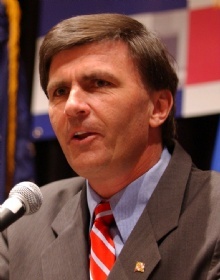 Robert Leroy "Bob" Ehrlich, Jr. is an American politician. He was governor of Maryland 2003-2007. He received his undergraduate degree at Princeton University and law degree at Wake Forest University Law School. He then worked as a lawyer in Baltimore. He was a member of the U.S. House of Representatives from Maryland 1995-2003. He was defeated in the 2002 elections of governors Robert Kennedy's eldest daughter Kathleen Kennedy Townsend. He lost the 2006 elections of governors against Martin O'Malley. He is born under the zodiac sagittarius, who is known for Philosophical, Motion, Experimentation, Optimism. Our collection contains 10 quotes who is written / told by Bob, under the main topic Family. "We discussed politics, but we also talked about the importance of hard work, personal responsibility, living within your means, keeping your word. Those lessons stay with you throughout your life"
"Thoughtful people of different political philosophies can disagree, but in a very agreeable manner"
"I support stem cell research, including embryonic stem cell research"
"Serving in Congress has been the honor of a lifetime"
"Politics is a contest among people of diverse backgrounds and philosophies, advocating different solutions to common problems. The system only works when principled, energetic people participate"
"I don't know what leadership is. You can't touch it. You can't feel it. It's not tangible. But I do know this: you recognize it when you see it"
"We're betting, at this place and this time, we have people ready for change in the state of Maryland"
"I promised her an interesting life and good food, and the rest is history"